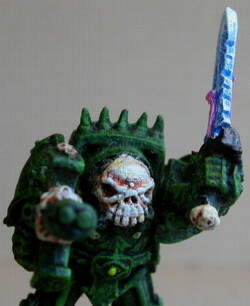 My Chaos Space Marine army is really old, but not as old as my Ork Army... Over the years I've become a better painter, some might even say a great painter. 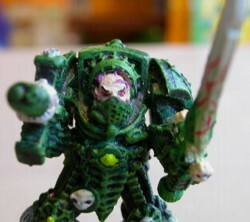 So in an effort to do better at Grand Tournaments and generally field a nicer more cohesive looking army, I set out to strip and repaint some of the classic lead Chaos Space Marine models in my collection. 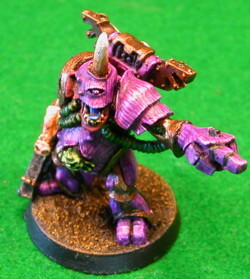 In some cases plastic models were stripped and repainted, this is a bit more risky as plastic can be damaged by chemicals easier. This was also necessitated by changes in the rules, but the rules keep changing and some models I wish I hadn't stripped. All the ones I photographed for the pre and post strip gallery are finished and I'll likely not strip that many models ever again, it was almost a third of my army. 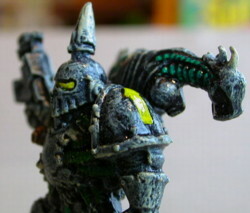 Chaos Lord in Terminator Armor with Demon Weapon This was one of the original dozen or so Diseased Sons, so the paint job was really old, but the model had both sentimental value and was a pretty cool classic sculpt so I stripped it and repainted it pretty much as best I can. It mainly sees the battlefield as a unit champion because I don't like to run expensive HQ choices. 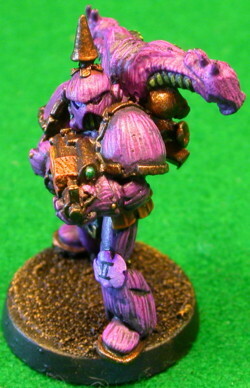 This is probably the third paint job this model has received as it may have had an Arden classic before I got it. 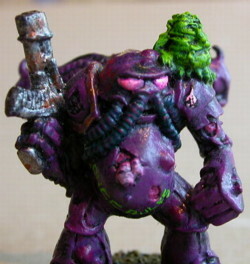 Classic Nurgle Renegade Sculpt besides being a classic this is the only copy of the model I owned so it was an obvious candidate to be repainted and used in future tournament armies to add character and Nurglishness to my force. 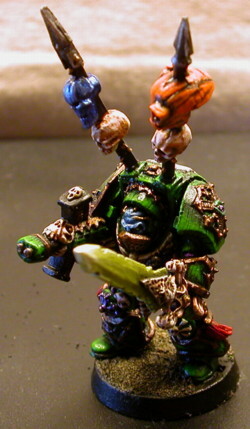 Converted Plague marine with Powerfist this was one of my early conversions and involved actually sawing off part of the metal model. 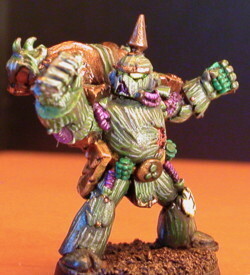 The reason I converted this model is I had two of this sculpt and the other one that came out at the same time. Figs were rare in the olden days especially on out of the way places like Vancouver Island. 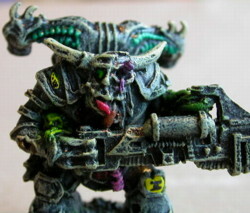 Classic Death Guard Model this was one of the early Jes Goodwin sculpts that established the look of the big four god specific Chaos Legions. 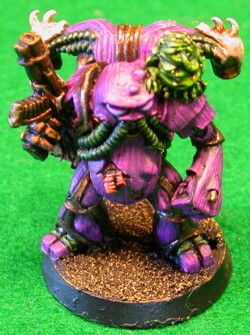 This again may be my only copy of this model, so it was an obvious candidate to repaint. It went into the boosted Syphilis squad. 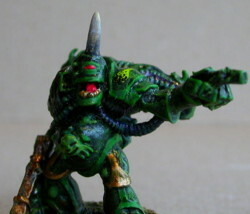 Chaos Renegade with Heavy Bolter this is another long time Diseased Son model, I stripped and repainted just about all my heavy weapon models as heavy weapons were denied to Nurgle for years by the game designer. 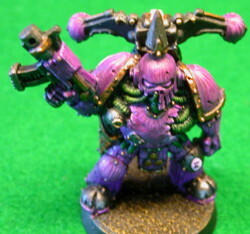 Once they came back I whipped up a Havoc Squad armed unfortunantly with heavy bolters. 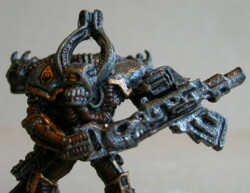 I would have preferred Autocannons but those models are rarer. It worked out so-so at Astronomi-con Vancouver 2008. 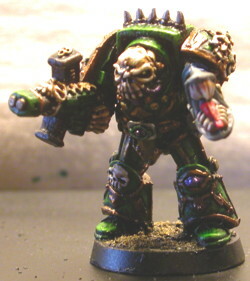 Chaos Terminator Champion or sergeants as they were known back in the day. This is actually a really great model, the skull mask is really cool, I wish I had another one of these, maybe I'll have to troll eBay for one. 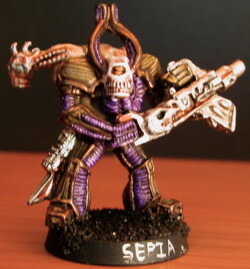 I swapped his arm with a squadmate when I repainted as I wanted more power weapons and less powerfists in my terminator squad. 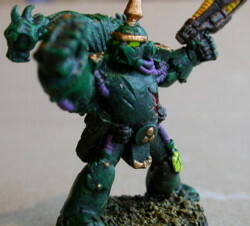 My favourite plague marine of all time so of course I repainted it. 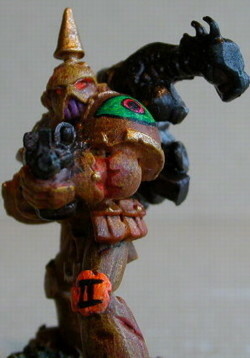 This sculpt is so classic GW basically did an updated version of a Plague Marine Champion pointing. Both those models are now in the same squad in my army, but that squad is so big I can often leave a few models at home. Every model is different in that squad, 20+ plague marines/Nurgle Renegades. 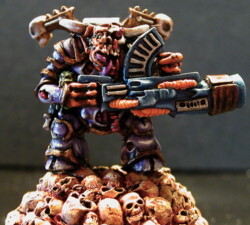 Another classic Death Guard model which I repainted, I have two of these, the other was converted to have an autocannon, a plastic Rogue Trader era chaos autocannon.